Finding the best income stocks requires a closer look at other metrics beyond the dividend yield. Dividend investors often prioritize a stock's yield above all other factors. While a stock's yield is certainly important, it's also important to examine five other key factors -- payout ratios, earnings growth, free cash flow growth, valuations, and historical dividend hikes. A stock's payout ratio is the percentage of a company's earnings which are allocated to dividend payments. The lower this percentage is, the more room a company has to grow its dividend. If the payout ratio remains above 100% for several quarters, the dividend is likely unsustainable. For example, hard drive maker Seagate (NASDAQ:STX) has a forward dividend yield of 6.4%, but it also has a whopping payout ratio of 200%. Its bigger rival, Western Digital (NASDAQ:WDC), pays a lower forward yield of 3%, but has a much more sustainable payout ratio of 56%. Income investors who only chase yield would probably buy Seagate instead of Western Digital, but they could be disappointed by a big dividend cut in the future. Investors should also avoid income stocks with declining earnings. For example, camera maker Canon (NYSE:CAJ) pays a forward yield of 4.7% and has a payout ratio of 86%. However, its earnings are also expected to fall 25% this year and another 5% next year due to the commoditization of the camera market. Those declines will inflate Canon's payout ratio and increase the likelihood of a dividend cut. Moreover, Canon's poor earnings growth is already reflected in the stock's 34% decline over the past five years. Therefore, investing in a declining stock with sliding earnings for a higher yield isn't a sound strategy. Earnings-based payout ratios can be distorted by buybacks, follow-on offerings, or all sorts of bottom line adjustments. As a result, some payout ratios don't accurately reflect the sustainability of certain dividends. That's why investors should also check a company's free cash flow (FCF), which is a company's operating cash flow minus its capital expenditures. By comparing a company's total dividend payments over the past year to its FCF, we can calculate the FCF payout ratio -- which more accurately reflects a dividend's sustainability. If we check Seagate again, we'll notice that it only paid out 61% of its FCF as dividends over the past 12 months. This means that Seagate can keep supporting its dividend for now, although the payments exceed its per-share profits every quarter. Companies sometimes do this if they believe that reducing the dividend would cause a big sell-off. But if a company's earnings and FCF payout ratios both exceed 100%, the dividend will likely be cut. 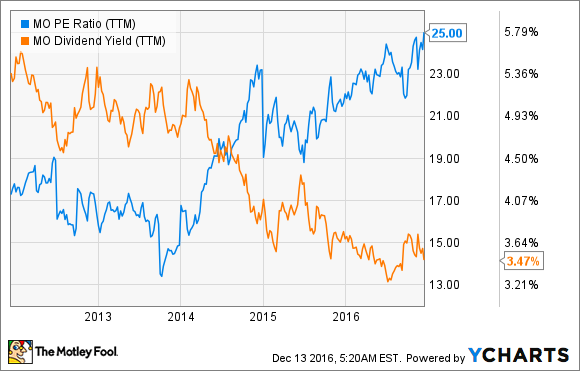 The low interest rate environment has made dividend stalwarts more attractive than bonds over the past few years. But that will change as interest rates rise, boosting the yields on high-grade bonds to levels which match those of income-generating stocks. Since bonds are fixed income investments with guaranteed returns, they will become the preferred vehicle of wealth preservation for income investors. This means that Altria, and other dividend stalwarts with high valuations and low yields, will be hit hard by interest rate hikes next year. Investors should avoid those types of dividend stocks and stick with ones that trade at discounts to their industry peers. Lastly, some stocks have high yields but don't raise their dividends annually. A company doesn't need to be a "dividend aristocrat" that has raised its payout for over 25 years, but a strong record of dividend hikes indicates that it's dedicated to rewarding long-term, buy-and-hold investors with a consistent cut of its profits. I personally own a lot of dividend stocks, and I've made plenty of mistakes chasing high-yield stocks in the past. But I found that by looking beyond yield, it was easier to find safer income stocks with sustainable yields, consistent dividend hikes, low valuations, and decent profit growth. Therefore, income investors should run their potential dividend plays through these tests to see if they're worthy long-term buys.